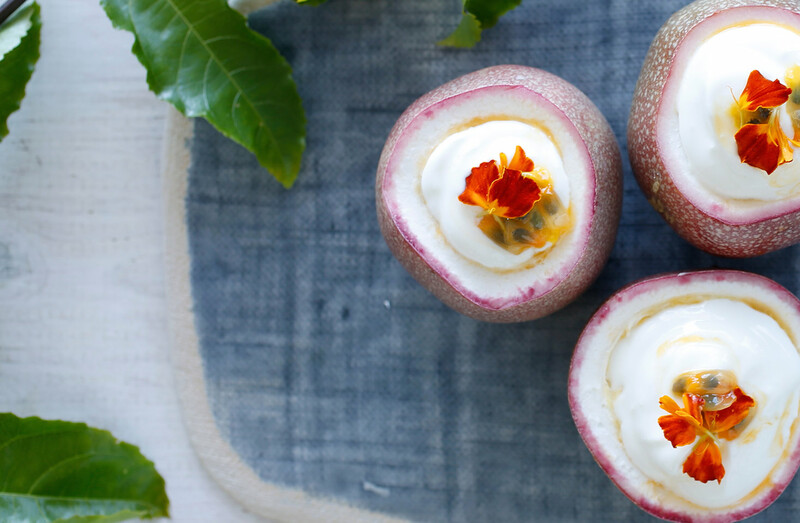 All year roundPassionfruit is available all year round but there are two supply peaks in summer (December – February) and winter (June – August). Bag itWith protective skin passionfruit don’t spoil easily but to make them last longer, keep them in a plastic bag in the fridge. It stops them dehydrating and they’ll last a month! Freeze itPassionfruit pulp freezes easily so for a refreshing treat freeze passionfruit pulp in ice trays or popsicle moulds. Pick plumpWrinkly doesn’t mean ripe. Go for plump, heavy passionfruit. Getting’ juicyInstead of cutting a passionfruit in half, chop the top off and eat it like a boiled egg with a spoon to avoid loosing the juice. Flavour boostMake everyday meals special! Scoop passionfruit onto cereal, enjoy with yoghurt, add to desserts, or mix it into your banana smoothie to kick start your day. Delicious dressingTry adding passionfruit to a traditional balsamic and olive oil dressing for a tasty, tangy change. Strain for seedlessIf the black, edible seeds don’t take your fancy and you’d prefer passionfruit pulp, simply strain the seeds out. Sweet treat passionMake simple desserts more exotic! Add to icecream, spoon onto a sponge cake, or use on a cheese platter in place of quince paste. Perfect pairingsPassionfruit goes well with fish, pork, coconut milk, vanilla, honey, banana, mango and pastry. Delectable drinkThe liquid nature of passionfruit pulp makes it perfect for adding to beverages for a tangy twist. Try making a passionfruit Caprioska by mixing vodka, lime and passionfruit. Choose plump, smooth passionfruit that is heavy for its size. Keep passionfruit in a plastic bag in the fridge and it will last up to a month, in the fruit bowl it will last two weeks. To enjoy a passionfruit on its own, chop the top off like a boiled egg rather than cutting in half and you won’t lose the delicious juices. Passionfruit is an impressive ingredient for entertaining. Slice the top off like an egg and pour a nip of Cointreau into the passionfruit for a no-fuss treat. Use passionfruit in baking recipes to add extra flavour and an exotic twist.